Shetland is so far removed from the rest of Scotland it can only be shown as an inset on maps. In fact, it is easier and quicker to get there from Norway than it is from London. This seems entirely appropriate, for Shetland is historically and culturally closer to Scandinavia than Britain. Many of its place-names are of Norse origin, and people here still celebrate ancient Viking festivals, such as Up Helly-Aa. Modern-day visitors tend to come by plane rather than longboat, and usually bring binoculars, for Shetland is a birdwatchers' paradise. It is home to countless bird species, many of them seeking refuge from the madding crowds. And, let's face it, there's no better place than here to get away from it all. Shetland has good air connections with the rest of the UK. There are regular flights to and from several maniland airports which are operated by FlyBe/Loganair. NorthLink Ferries, Tel. 0845 6000 449, NorthLink Ferries operate the ferry route to Shetland from the Scottish mainland. This daily service sails between Aberdeen and Lerwick and takes 12 hrs. From Aberdeen, a single passenger fare costs from £20.80 and a single car fare costs from £84.70. Cars should be booked in advance. NorthLink Ferries also operate a ferry that stops in Orkney before traveling onwards to Shetland. Tel. 0845 6000 449 for further details of timetables and prices. Shetland has around 500 miles of good roads and an extensive public service links Lerwick with all towns. The main tourist office is in Lerwick. Websites such as www.visitshetland.com and www.shetland-tourism-co.uk carries links to events, transport, accommodation and local operators. There is a regular scheduled inter-island service from Tingwall Airport near Lerwick, with Loganair, Tel. 01595-840246, to the islands of Foula (£42 return), Fair Isle (£74 return), Papa Stour (£32 return) and Out Skerries (£36 return). 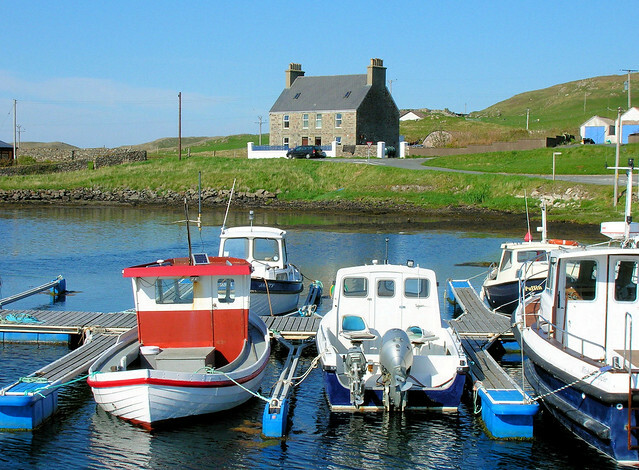 There are regular daily car ferries between Lerwick and Bressay (5 mins), East Mainland and Whalsay (30 mins), North Mainland and Yell(20 mins), Yell and Unst (10 mins), and Yelland Fetlar (25 mins). Fares on all these routes are £1.20 per passenger and £2.90 per car. There's a less frequent car ferry service between East Mainland and Skerries (Mon, Fri, Sat and Sun; 1 hr 30 mins), and Lerwick and Skerries (Tue and Thu; 2 hrs 30 mins). Fares on these routes are £2.10 per passenger and £2.90 per car. Bookings are essential. There's also a passenger/cargo ferry service between West Mainland and Papa Stour (Mon, Wed, Fri, Sat and Sun; 40 mins), West Mainland and Foula (Tue, Sat and alternate Thu; 2 hrs), Scalloway and Foula (alternate Thu; 3 hrs), South Mainlandand Fair Isle (Tue, Sat and alternate Thu; 2 hrs 30 mins), and Lerwick and Fair Isle (alternate Thu; 4 € hrs). Fares on these routes are £2.20 for an adult single and bookings are also essential. Shetland has around 500 miles of good roads, and an extensive public bus service links Lerwick with all towns, villages and tourist sights. There are several bus operators. For detailed information on all bus services, call Tel. 01595-694100 (Mon-Sat 0900-1715). A Shetland Transport Timetable, published by Shetland Islands Council, contains details of all air, sea and bus services throughout the islands. It is available from the tourist office in Lerwick. Small island on south west of Mainland island that is connected to the main island by a "tombolo" or spit and is a typical feature of the Shetland coastline. The inlets are known locally as Voes as in Sullom Voe. Makes a great walk! Local museum for Fetlar and small Shetland islands. 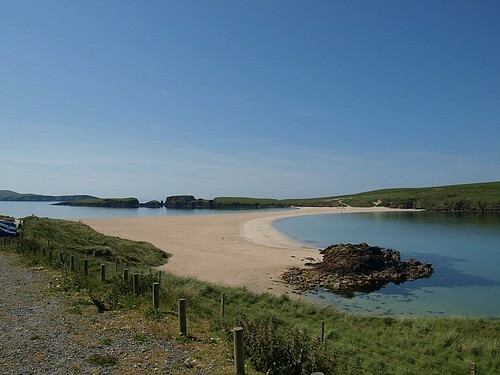 It is situated on the west side of the Shetland mainland in the picturesque village of Walls. 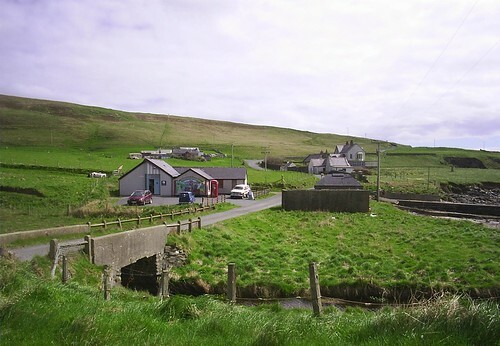 South House is a homely, quirky cosy Shetland Croft house which sits on the southern shores of Ronas Voe, about 50 yards from a beach and ruins of a historic fishing station.